People You Can Trust- We will rigorously screen all applicants to ensure that our team is made up of reliable, trustworthy people. We will be honest and forthright with every customer, every time. No Risk 100% Satisfaction Guarantee- We insist on your 100% satisfaction. If a problem does arise, we will work diligently and cheerfully to make it right. Licensed, Insured & Certified to Protect YOU- We are a state licensed HVAC contractor with all required liability insurance and workers compensation coverage. Our Technicians and installers are certified to deliver top-quality results for you. No Surprises or Hidden Costs- Before we begin work on your home, we will provide detailed written specifications of the work we will perform, and we guarantee that we will provide quality installation and workmanship according to those specifications. We will never surprise you with hidden costs or perform additional work without your consent. 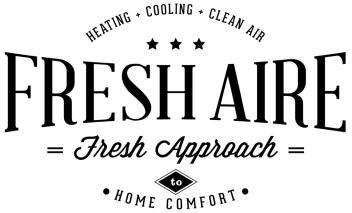 Customer Respect Guarantee- The Fresh Aire Crew will protect your home and possessions with respect at all times. We always use drop cloths, protective floor mats, etc.. and we clean up when we are finished. We will also be respectful of your family and neighbors by being friendly and respectful at all times. We will never smoke or use profanity while working at your home. Great Value Guarantee- We will continually strive to bring you the best value for your dollar. We take pride in offering our customers the best "Bang for the Buck" by providing superior service, strong warranties, top quality workmanship and by going the extra mile for you.